Get Paid to Help Others Work At Home! Did you know that Work-At-Home Success has an affiliate program through which you can make money helping others find their own work-at-home path? 1. Sign up for the program. 3. Get your affiliate links. 4. Let others know about the great products you’ve found to help them work at home. 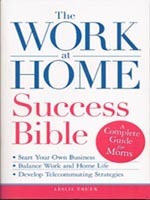 Sign up for Amazon.com’s Associate’s program to help spread the word about The Work-At-Home Success Bible. Joining is free and easy. Sign up for Amazon.com’s Associate’s program. Log into your associate’s account. Click on the “Links and Banners” tab at the top of the page. Click on “Add Product Links now” from the first option. Click on “Get Link” next to the book’s option. Customize the link if you want (optional) in box 2. View the preview provided to see how your link will look. Copy the code in box 3 and paste it on your web page or blog. This is some kind of an online job finding. This is very useful for people looking for domestic job. 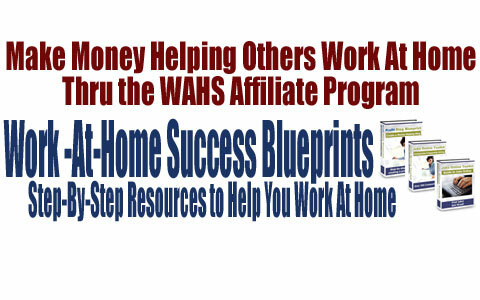 Work-At-Home Successes affiliate products are information and resources to teach people how to find and get hired to work at home jobs, or how to work at home.